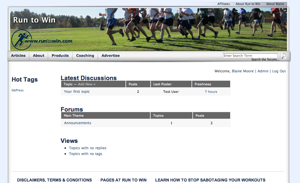 It’s been a long time coming…but Run to Win has gotten a facelift! My old theme was designed over 5 years ago and hasn’t changed much since. Now, the site should be a bit easier to navigate, it should be easier to find what you are looking for, and little things such as the YouTube videos being too wide to fully fit onto the page are now a thing of the past! In celebration of which, I’m going to be giving away a bunch of swag, so keep reading for details about how to enter. Transcription coming soon…please check back later. Here’s what I’m going to do. The contest will be very easy to enter, and there will be many ways to earn a chance at a prize. Next week, I will compile all the names and how many chances you have to win, and will randomly choose winners based on your number of entries. Prizes will also be rewarded at random. I’ll update this post with new prizes throughout the week as I think of them, so just scroll down to see what you can (currently) win and then check back later to see what’s been added. Entering the contest is easy, and to suit everybody’s style of browsing the internet I’ve provided many different ways. Don’t feel as though you need to do everything, though, it could be overwhelming! Subscribe to my Newsletter: If you are already subscribed, then you are already entered in the contest. (That was easy, right?) If not, there is a newsletter signup form in the sidebar to the right and at the bottom of the screen, and not only will you be entered into the giveaway but I’ll also give you a free copy of my report, The 3 Components of an Effective Workout. Participate in the Community Forum: I’ve set up a more interactive community here at Run to Win, and I’d love to give it a kick-start! For every post you make in the forums, you’ll get an entry into the contest. Don’t spam, though, or your comments will be deleted and you may get kicked out. Comments that don’t add anything to the discussion such as “I agree with what you said” without offering anything else are also not eligible to serve as entries into the contest. Registration is free so just click the community button and start interacting! Mention This Contest On Your Website: If you link to this post and mention the new site design and the giveaway on your website, you’ll get another entry into the contest. Just leave a trackback or a comment below letting me know where to find your post. Let Me Know What You Think in the Comments: I’m a big fan of feedback; positive is better, but constructive is fine too. Do you like the new site design? Is there something I could do better? Just leave a comment below letting me know what you think and that’s good for another entry. Make a Purchase From My Store: Everything else is something you can do to enter the contest for free, but if you really want a lot of entries, I’ll give you 1 entry into the contest for every dollar you spend before the contest ends. I’ve got some great Run to Win running shirts. So that’s how to enter, now what will you win? A digital download of my “How to Raise Money For Non-Profits” coaching session with Mike Brooks worth $17.95. A digital download of my “How to Regain and Maintain Your Competitive Edge as You Age” coaching session with Tom Ryan worth $17.95. Digital access to my “Yoga For Runners” coaching session with Michael Gaige worth $24.95. A $20 gift certificate to Road ID. A SOC Box Greeting Card System for bragging about your next race worth $49. A copy of Meb Keflezighi’s book, Run to Overcome worth $24.99. The contest will run from Monday, November 22, 2010 through Sunday, November 28, 2010. Next week, In the next couple of weeks, I will begin drawing names from each category and will draw for awarding prizes. For physical products, shipping is included to anywhere in the 48 contiguous United States, and we’ll work something out if you live elsewhere. I’m the sole judge and the rules may change at any time without notice. So with all that out of the way…what do you think of the new site? Site looks great. One quick suggestion: add social sharing tools so your fans can quickly and easily share your content -- a retweet button and the Facebook Like button are essential for blogs now and help you get more traffic and help your readers spread the word. The site looks nice. Fresh. Thanks for the contest. I always like the possibility to get new running related stuff. Also, I am subscribed to your YouTube! I like the new site. It is very easy to navigate and I really like the scroll of pictures, events and info. that is at the top of the page…nice touch. I also already subscribe to your newsletter and “Like” you on Facebook. Thank you so much for sharing all your great advice. sounds good. I hope I am winning!!!!! I wish it could be a little wider. On both sides I have this blue columns, each about 2 and half inches wide. I would prefer larger print or wider column to read. It like the TV vertical hold is stuck. Have winners been announced? If so, I missed the announcement.